In early 2010, Droylsden Glass Commercial Director Kevin Thackeray contacted Stockport based IVS Training and Assessment Ltd about the possibility of them delivering Fenestration qualifications to the business. 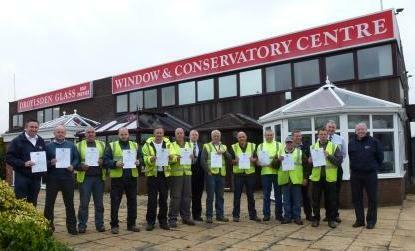 IVS visited Droylsden Glass, a manufacturer and installer of high-quality windows, doors and conservatories based in Audenshaw, Manchester, and began working with 11 installers on the GQA Level 2 Fenestration Installation qualification. GQA External Verifier Harry Charnock attended a presentation where the latest group of Droylsden Glass Installers were presented with their GQA qualification Certificates along with members of the Droylsden Glass management team.